Kurdi Family Tragedy: Real problem is not that the Canadian State denied them refugee asylum but that it helped create the refugee crisis in the first place! 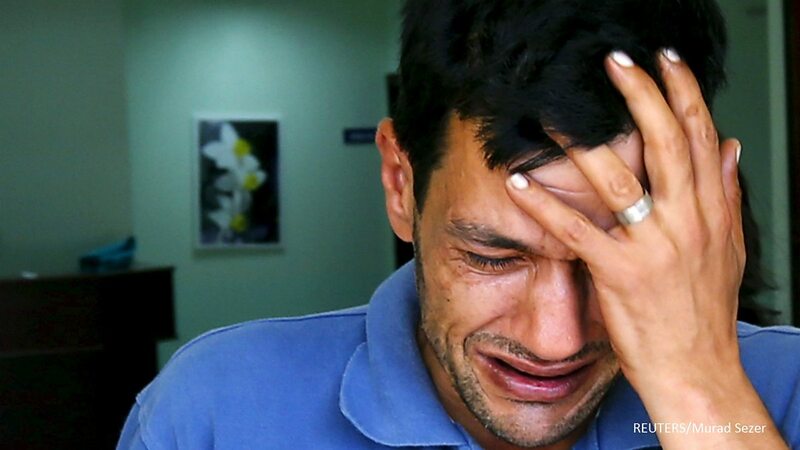 -Abdullah Kurdi grieves the deaths of his two young children and wife. AS the world watches the tragedy of the Kurdi family unfold—where two young children, Aylan and Galip, and their mother drowned to death (along with several others) while trying to seek refuge in Europe—there has been public outcry against the Canadian government for refusing Abdullah Kurdi and his family, who fled Syria for Turkey due to the ongoing conflict in Syria, refugee status. While the deaths are no doubt a tragedy, such criticism is shortsighted and misplaced. The real problem is not that the Canadian government refused the family’s application for refugee status (Abdullah Kurdi has a sister in Vancouver that was trying to sponsor the family) but that it (along with Western allies like the US and France) directly or indirectly helped to create the Syrian “civil conflict” and the ensuing refugee crisis in the first place! While many people have interpreted the Kurdi drownings as a migrant crisis or refugee crisis, the real crisis is one of Western intervention in (often disguised and touted as humanitarian intervention) and destabilization of other countries and regimes, and the direct or indirect arming and funding of violent insurgencies that led to the refugee crisis in Syria and other states like Iraq, Libya, etc. Whether leaders like Syria’s Bashar Al-Assad or Iraq’s Saddam Hussein are evil men is beside the point and serves to divert attention from the real issue: that western governments (who are responsible for far more global misery and blood shed than all of these “evil men” combined) don’t truly care about the plight of the people of Syria or Iraq or Libya, or Afghanistan for that matter. “Humanitarian intervention”—which has more appropriately been described as humanitarian imperialism—is little more than a ploy for western and NATO powers to serve their own interests in the region in the name of protecting or liberating the locals. Years after the outbreak of the insurgency in Syria it is now known that, in trying to oust Syria’s Al Assad, western powers have inadvertently armed and aided ISIS and other terrorist organizations and terrorist violence in the region. As I have written elsewhere, it was reported by the BBC in 2013 that states such as France and the United States gave or planned to give arms and military support to the Free Syria Army, a group openly linked to ISIS, in Syria. Let us not forget that the entire war on terrorism was begun on a lie—i.e., that Saddam Hussein had weapons of mass destruction—and false pretenses—that the US and allies were invading Iraq to “liberate” and save the people from weapons of mass destruction—by Bush and Blair back in 2003. And while Canadians like to feel good about the fact that Canada did not join the invasion of Iraq in 2003, Canada was indirectly involved as a weapons manufacturer and supplier from the outset of that war. Similarly, as a NATO member and an imperial ally of the US, Canada is implicitly linked to the funding and supporting of the types of violence and insurgency that led to the present-day Syrian refugee crisis to begin with. That is the issue we should be addressing and lamenting; for such support and self-interested foreign meddling is what brought us to mourning the loss of two young Syrian children today.